A dramatic visit to Jerusalem by the Egyptian President Anwar Sadat in 1977 opened the doors to a peace agreement between Egypt and Israel, the first and most important of the agreements between Israel and its neighbours. Sadat's opposite number in Israel was Prime Minister Menachem Begin. From the right-wing Likud group and a former fighter against the British, Begin was determined to hold onto what he saw as the "Land of Israel" on the West Bank and which he called Judea and Samaria, after their biblical names. However, Begin did not include the Sinai in his vision and proved to be a peacemaker with Egypt. 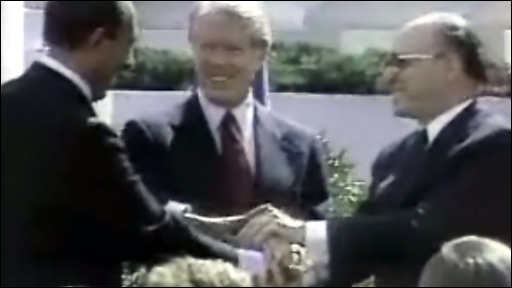 In 1978, the US President Jimmy Carter invited Begin and Sadat to Camp David, near Washington, and there they made an agreement in principle that was followed up by a treaty in 1979. Israel agreed to hand back to Egypt the whole of the Sinai, and Egypt agreed to recognise Israel. Israel's borders on one flank had at last been settled. And although the peace between the two countries has not been a warm one, it has held. However, the agreement did little for the Palestinians. Sixty years ago, a family of Palestinian peasants began their long exile. A history of 60 years of Israel in video, pictures and text.